# Extracts represent data extracted during pipeline processing. # "metrics" and "plots" respectively. Note that tfma.Extracts are never written out directly they must always go through an evaluator to produce a tfma.evaluators.Evaluation that is then written out. Also note that tfma.Extracts are dicts that are stored in a beam.pvalue.PCollection (i.e. beam.PTransforms take as input beam.pvalue.PCollection[tfma.Extracts]) whereas a tfma.evaluators.Evaluation is a dict whose values are beam.pvalue.PCollections (i.e. beam.PTransforms take the dict itself as the argument for the beam.value.PCollection input). In other words the tfma.evaluators.Evaluation is used at pipeline construction time, but the tfma.Extracts are used at pipeline runtime. The ReadInputs stage is made up of a transform that takes raw inputs (tf.train.Example, CSV, ...) and converts them into extracts. Today the extracts are represented as raw input bytes stored under tfma.INPUT_KEY, however the extracts can be in any form that is compatible with the extraction pipeline -- meaning that it creates tfma.Extracts as output, and that those extracts are compatible with downstream extractors. It is up to the different extractors to clearly document what they require. Note that outside of very special cases, it is almost always the case that one tfma.Extracts in a beam.pvalue.PCollection will correspond to one example from the model. # them using post export metrics to produce serialized metrics and plots. Notice that an evaluator is a beam.PTransform that takes tfma.Extracts as inputs. There is nothing stopping an implementation from performing additional transformations on the extracts as part of the evaluation process. This is exactly what the tfma.evaluators.MetricsAndPlotsEvaluator does. It takes the incoming features, labels, and predictions and runs them through tfma.slicer.FanoutSlices to group them by slices prior to performing the actual metrics and plots evaluation. Also note that an evaluator can produce any output it wants. In the case of the tfma.evaluators.MetricsAndPlotsEvaluator the output is in the form of serialized protos. # serializes the associated PCollections of data to a sink. Since the tfma.evaluators.Evaluation passed to the writers contains the output for all of the evaluators combined, a tfma.writers.Write helper transform is provided that writers can use in their ptransform implementations to select the appropriate beam.PCollections based on an output key (see below for an example). 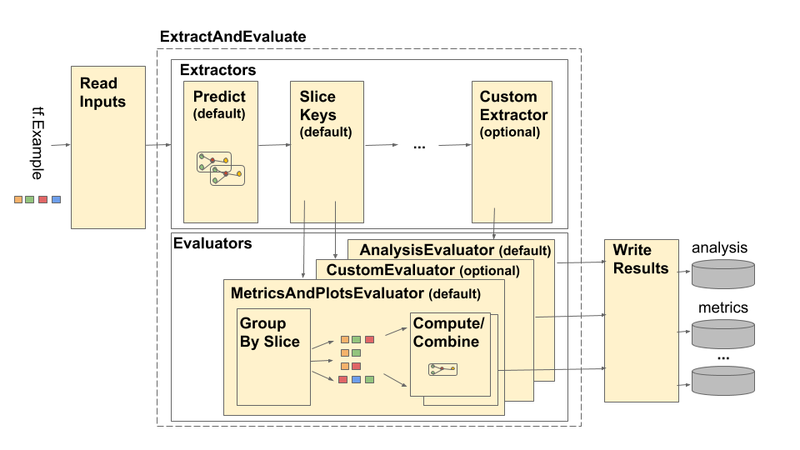 The tfma.run_model_analysis method takes extractors, evaluators, and writers arguments for customing the extractors, evaluators, and writers used by the pipeline. If no arguments are provided then tfma.default_extractors, tfma.default_evaluators, and tfma.default_writers are used by default. To create a custom extractor, create a tfma.extractors.Extractor type that wraps a beam.PTransform taking tfma.Extracts as input and returning tfma.Extracts as output. Examples of extractors are available under tfma.extractors. To create a custom evaluator, create a tfma.evaluators.Evaluator type that wraps a beam.PTransform taking tfma.Extracts as input and returning tfma.evaluators.Evaluation as output. A very basic evaluator might just take the incoming tfma.Extracts and output them for storing in a table. This is exactly what the tfma.evaluators.AnalysisTableEvaluator does. A more complicated evaluator might perform additional processing and data aggregation. See the tfma.evaluators.MetricsAndPlotsEvaluator as an example.. Note that the tfma.evaluators.MetricsAndPlotsEvaluator itself can be customized to support custom metrics (see tfma.post_export_metrics for more details). A writer's inputs depend on the output of the associated evaluator. For the above example, the output is a serialized proto produced by the tfma.evaluators.MetricsAndPlotsEvaluator. A writer for the tfma.evaluators.AnalysisTableEvaluator would be responsible for writing out a beam.pvalue.PCollection of tfma.Extracts. Note that a writer is associated with the output of an evaluator via the output key used (e.g. tfma.METRICS_KEY, tfma.ANALYSIS_KEY, etc).